Texas senator Ted Cruz is suspending his presidential campaign for the Republican nomination following his loss to Donald Trump in the Indiana Republican primary, Cruz announced at a rally tonight in Indianapolis. "Together we left it all in the field in Indiana, we gave it everything we got," he said. 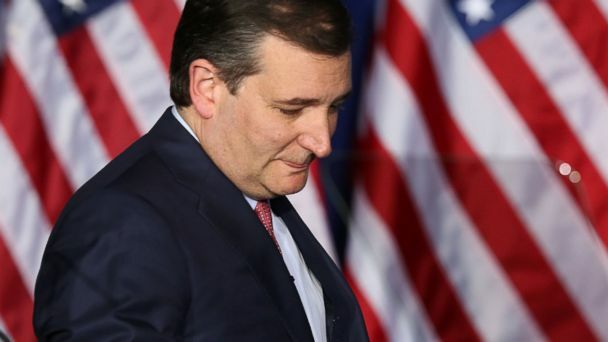 "So with a heavy a heart, but with boundless optimism, for the long term future of our nation, we are suspending our campaign," Cruz told supporters. Several Cruz staffers were crying before Cruz took the stage and his family appeared visibly emotional alongside Cruz as he made his announcement. "From the beginning I said I would continue on, as long as there was a viable path," Cruz said. "Tonight, I'm sorry to say, it appears that path has been foreclosed." Cruz was mathematically eliminated from reaching the 1,237 delegates needed to clinch the nomination on the first ballot at July's GOP convention. The Texas senator ended his campaign following his attacks on Trump, who he called a "pathological liar," "narcissist" and "utterly amoral" earlier Tuesday. Earlier this week, Cruz had vowed to continue even if he lost in Indiana and said yesterday he would "absolutely" have a path to victory if he lost in the Hoosier state. "We gave it everything we got. But the voters chose another path," Cruz told a crowd of supporters. The Texas senator was the first Republican to announce his candidacy for president in March of last year, billing himself as an "outsider" candidate. Cruz was the first Latino GOP candidate to win the Iowa caucuses. Cruz officially announced his 2016 presidential campaign on Twitter in March 2015, posting a video saying it will require a "new generation" to lead the country. "It's a time for truth, a time to rise to the challenge, just as Americans have always done," he said in the video. "I believe in America and her people and I believe we can stand up and restore our promise," the Republican senator says in the video. "It's going to take a new generation of courageous conservatives to help make America great again and I'm ready to stand with you to lead the fight."